Acne is the result of pores in the skin becoming clogged or blocked, resulting in oil becoming trapped underneath the surface of the skin. This can cause swelling, inflammation and pain or tenderness of the affected skin. In some cases the inflammation can occur deep within the skin, resulting in cyst formation. Severe acne can result in scars that cause permanent cosmetic problems. Scars resulting from acne can be minimized in their appearance by using New-Skin's scar treatment products. 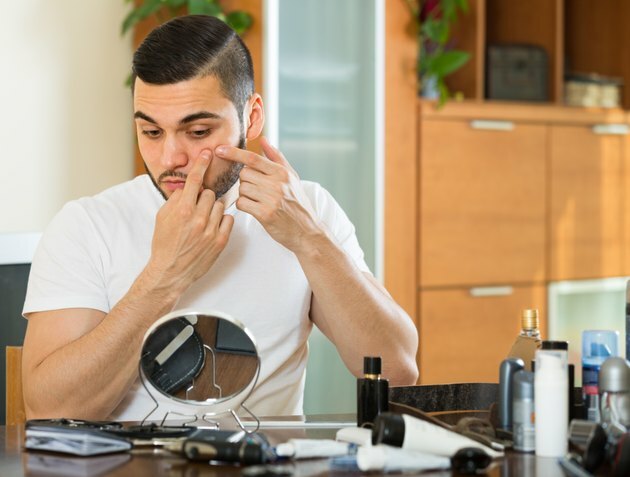 Patients looking to minimize the appearance of acne scars should know, however, that New-Skin's scar treatment products work best for raised or hypertrophic scars and may be less effective for pitted scars. Make sure that the affected area is free of acne. Treatments designed to fill acne scars may not work properly if the skin currently has active acne, Acne.org reports. Not only can active acne cause new scars to form, causing a major setback in treatment, but the scar treatment itself can cause additional irritation and inflammation for areas of active acne. Wash and pat dry the area affected by the acne scars. This will make sure that the skin that will be treated is clean, which will keep the medication from being blocked by dirt or oil. If the scar is damp, the medication may not be able to penetrate into the skin. Using the applicator that comes with the product, massage a thin layer of the New-Skin product into the acne scar. If there is any excess liquid product on the face, gently dab it away using a tissue. Allow the New-Skin liquid to dry before applying cosmetics. Apply the New-Skin product twice a day, once in the morning and once at night. This product needs regular and repeated use to be effective; the New Skin website notes that it can take up to six weeks for the scar to begin to diminish in appearance.